Archives : NIFTY NEEDS TO CLOSE ABOVE 200DMA - 04/11/2011. NIFTY NEEDS TO CLOSE ABOVE 200DMA – 04/11/2011. NIFTY 5332-5360 : STRONG RESISTANCE ZONE. From one range to another and that seems to be the story of the market so far as the Nifty seems to be settling in a range of 5200 on the lower side and 5400 on the higher side. There exists strong Resistance zone between Sensex 17788-17845 and Nifty 5332-5360, which is a result of the confluence zone formed by the 61.8% of the short term or immediate fall, 50% of the intermediate or medium term fall and 38.2% of the higher term time frame fall. This Resistance zone is further strengthened by the presence of the long term moving average (i.e. 200dma) which is just above it. Despite several attempts to breach this strong resistance zone, the market does not seem to be in a mood to give up so easily and hence we can expect the resistance zone to be tested once again in the near future. For further upmove, market needs to close and stay above the 200dma. The Sensex opened the week at 17806, made a high of 17813, a low of 17278 and closed the week at 17562. The Sensex lost 242 points on a weekly basis. Similarly Nifty opened the week at 5358, made a high of 5360, a low of 5201 and closed the week at 5284. The Nifty too closed with a weekly loss of 76 points. Both Sensex and Nifty have formed a black body candle after opening with a big gap up on Friday. Since the closing on Friday is still above previous day i.e. Thursday’s closing, a bearish pattern has not yet been formed on the daily charts. On the weekly charts there is a Bearish Harami pattern formed. This is a bearish reversal pattern but it requires a confirmation in the form of a black body candle for the next week. Interestingly this week has formed a small black body which has no upper shadow and a long lower shadow and is placed within the top half of the previous weeks white candle. Market is currently facing a strong resistance zone between Sensex 17788-17845 and Nifty 5332-5360. This resistance zone is formed by the convergence of the 61.8% of the immediate fall, 50% of the intermediate fall and 38.2% of the entire fall. This is further strengthened by the presence of Falling Gap and the 200dma. Thus we have strong Resistance Zone between Sensex 17788-17845 and Nifty 5332-5360. Both Sensex and Nifty have continued to remain above the short term average of 20dma (Sensex – 17090 and Nifty – 5141) and medium term average of 50dma (Sensex – 16761 and Nifty – 5037). As a result the short and medium term trends remain up. This week both the indices continued to remain below the 200dma (Sensex – 17976 and Nifty – 5396). As a result the long term trend continues to remain down but the 200dma is likely to be tested again. Both the indices were moving within a well defined trading range i.e. between Sensex 15745 to 17211 and Nifty 4720 to 5170 for a period of more than three months. The top and bottom end of the trading range had been tested four times without getting breached. Finally this Trading Range was breached two weeks back and the target for this Trading Range Breakout falls at Sensex 18692 and Nifty 5631. Since last Deepawali, both the indices have been moving lower in a Falling Channel and the top end of the Falling Channel falls at Sensex 18167 and Nifty 5461. This level should act as good Resistance level. On a longer term timeframe the Bearish Head & Shoulders on the weekly charts still stand, as long as the Nifty remains below 5740. MACD and ROC both are in Buy mode and in positive territory. RSI continues to remain in Buy mode and is at 60. Stochastic Oscillator is giving a Sell as %K is below %D. ADX is quite low at 19 suggesting that the index is consolidating in sideways mode. Directional Indicators continue in Buy mode as +DI is way above -DI. OBV has faltered again and once again has shifted to Sell mode and so does MFI which has just gone below the centerline which suggests money moving out of the market. Bollinger Band which had given a Buy signal last week continues to remain in buy mode. Nifty OI PCR is at 1.39. 5400 strike is having highest Call buildup and highest Put writing is seen at 5000 strike price. 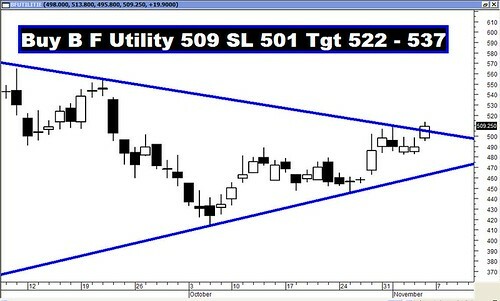 Thus Nifty is expected to move in a range of 5000 to 5400. Trendline Resistance for the Sensex is at 18167. Trendline Support for the Sensex is at 17186. 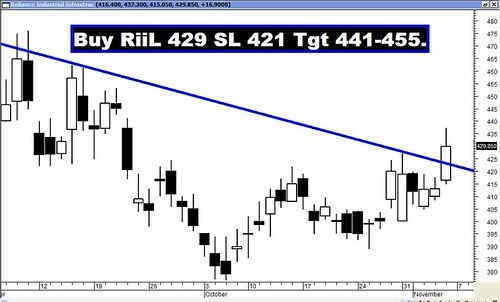 Trendline Resistance for the Nifty is at 5461. Trendline Support for the Nifty will be at 5156. For the week ahead, Sensex will find Support at 17278-16989-16669 and will find Resistance at 17857-18131-18429. For the week ahead, Nifty will find Support at 5197-5109-5011 and will find Resistance at 5369-5453-5539. Once again all the recommendations reached their targets with ease, with only Omaxe missing out by a whisker. But the Star performer of the week was IVRCL Infra which went up by a whopping 12% !! !